Inspired by Cape Cod on the east coast of the USA, designer Philippe Starck designed this extraordinary bathroom series. The Style of the natural area like cape cod is also implanted in the bathroom furniture and ceramics: The natural connection is to be reflected by the minimalist use of real raw materials. Forms and materials are original and natural, as with the oval freestanding bathtub and the vanity unit with airy installation, which provides storage space. It is used in the product series real wood, which is cut in one piece from a trunk. This is combined with the latest ceramic materials that allow fine lines and design hardly set limits. The wash basin cabinets of the Cape Cod range convince by a fusion of material and shaping. A chrome frame is combined with solid wood shelves in the colors European oak, American walnut, white beech or oak vintage. The solid wood panels are cut directly from the tree trunk and make every vanity unit unique. For those who do not like wood, there is a plate in white high-gloss varnish. The substructures are available in two versions: In open form with console and storage plate at the bottom or in closed form with box-shaped installation. 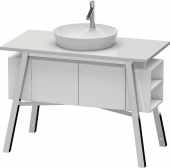 This has doors and side regulators and it is only available in white high gloss lacquer. 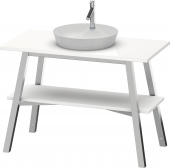 For this implementation, Duravit recommends a compact siphon for better space. Both versions have a size of 1120 x 570 mm. 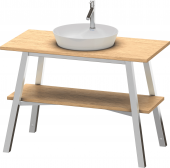 For maximum individuality, the Cape Cod product series offers three different wash basin designs: round with a diameter of 480 mm, square in the size 460 x 460 mm and tri-oval in the size 500 x 405 mm. The round and square design are characterized by a ceramic island, which is provided for the valve. This is where nature appears again, as the overall design is reminiscent of a small lake in nature. In addition, Duravit adjusts itself from other designs with a classic tap hole bench and brings something new, individual to the bathroom. Thanks to the new material DuraCeram®, the Washbasin can be realized with extra-thin edges of only 5 mm and remains robust. Due to the narrow edges, the wash bowls are also particularly easy to clean, because no dirt can settle on the edge. In addition, the glaze WonderGliss can be used to make the surface even less susceptible to lime and dirt. The Cape Cod series has a border and therein incorporated a fixed LED with a lifetime of over 30,000 hours. 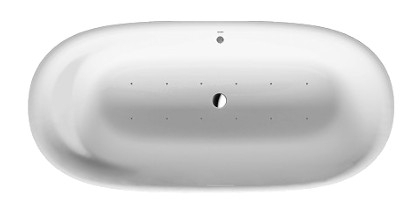 You can activate the light with a sensor, which is located on the right lower side. Because of this switch, the mirror should have a minimum distance of 75 mm to reflective surfaces. The mirror has a size of 766 x 60 mm. With its organically rounded shapes, the bathtub fits perfectly into the natural bathroom. You get the perfect comfort with the headrest integrated into the backrest (on one side of the bathtub). The material DuraSolid allows a particularly thin and filigree tub rim, which gently restrains itself. 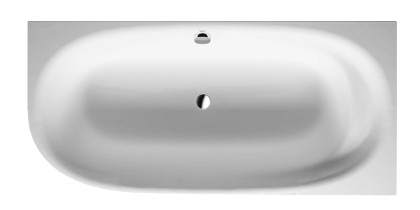 The bathtub is available as a freestanding bathtub, pre-wall bathtub and as corner version for right and left. Each model is also available as a whirlpool tub and provides additional relaxation in the natural bathroom. The free-standing bathtub has a size of 1855 x 885 mm, the other installation versions are 1990 x 900 mm in size. For an even more relaxing bathing, bathtubs are optionally available with an integrated sound system for Bluetooth-compatible devices. As a combined product, all the other products of the designer Philippe Starck offer themselves to a uniform overall picture. Here, for example, the toilets and bidets of the series Starck 1, Starck 2 or Me by Starck would be mentioned.